The STI Clinic has introduced a new form of testing for chlamydia and gonorrhoea, which allows for quicker results. The new test for chlamydia and gonorrhoea has results back within 4 hours of the sample being received at the laboratory. We can still test using our older method of testing with results back in 24 hours if time is not important and you wish to save some money. 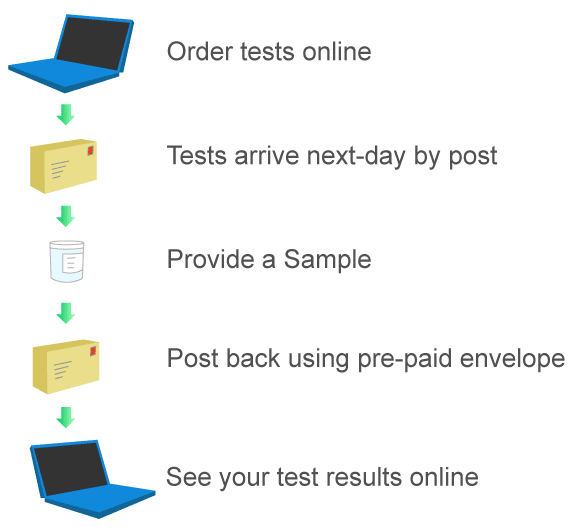 The 24 hour test uses a different type of analyser and is half the price of the 4 hour test. Please click here to go to our original 24 hour test. Is this fast test appropriate? If you have symptoms in the genital area then we recommend a full screen so that we can correctly ascertain the cause of these symptoms. It is impossible to diagnose an STI from the symptoms - testing is always essential. If you test positive for anything then antibiotic treatment is included. We will need to take some brief medical details online and then an appropriate antibiotic is sent to you by overnight courier. All our lab work is done by The Doctors Laboratory, which is one of the leading pathology services in the UK. This lab is used by most private clinics in London, so you know that you are in good hands. The lab is fully accredited as you would expect. If you require a copy of the full lab report then this can be sent to you free of charge. You can get tested at any time but if you are being tested after a perceived risky event, a positive result may not show for 7 days in the case of gonorrhoea and 14 days in the case of chlamydia. If you have symptoms in the genital area, such as discharge or a burning sensation when passing urine, please opt for our full screen as this would be the most appropriate test.